“Durant els últims quatre anys, Carlo Gatta i Javier Carrillo, juntament amb Simone Balocco (investigador de la Universitat de Barcelona al CVC), han desenvolupat una eina informàtica, anomenada X-QPA, que quantifica el mal sofert pels teixits miocàrdics. El software processa la successió d’imatges de raigs X, fins a 15 per segon, i obté «una mesura quantitativa, repetible i més objectiva de la irrigació miocàrdica, identificant les regions amb un menor reg sanguini», explica Gatta. També facilita la comparació ràpida entre l’estat dels teixits abans i després de l’operació.” El Periodico, 4/02/2013, p.68. The Prize of the year “Antonio Caparros” of the University of Barcelona for the best technology transfer project of 2013 has been awarded to Dr. Petia Radeva, and the rest of the IVUS team: Dr. Simone Balocco, Dr. Francesco Ciompi, Dr. Fina Mauri, Dr. Carlo Gatta, Dr. Oriol Pujol, Dr. Marina Alberti, Alberto Gonzalez, for the project “Computer Vision Methods to Assist the Treatment of Atherosclerotic Plaque by IVUS”. Congratulations to the whole team! The researcher team has been working for years in the field of research in Vision Computer and its applications to various fields of medical image analysis. The result of the research conducted over the years had led to 3 international patents. The awarded project stems from a research program that The foundation Bosch and Gimpera of the University of Barcelona signed with the University Hospital ” Germans Trias i Pujol” and the company Boston Scientific. The research program was the first stage dedicated to the design and development of algorithms based on computer vision and machine learning to detect and quantify the contours of the coronary arteries from IVUS images, which resulted in three international patents. The second phase developed an innovative methodology aimed at automatic detection of stents in IVUS images. The jury chose our project among 16 applications. It highlighted the importance of medical imaging modality developed in the treatment of a pathological artery with the presence of atherosclerosis and information to assess the success of the intervention. It also highlights the recipient of the transfer the company Boston Scientific , one of the world’s leading companies specializing in developing and supplying devices for diagnosis and treatment of diseases in various fields of medicine. Premio al Mejor Trabajo Científico en Ciencias Exactas y Naturales a Dr. Misael Rosales por el trabajo “Modeling of Catheter Motion for 3-D IVUS” por la Gobernación del Estado de Mérida y la Unidad Teritorial del Ministerio del Poder Popular para Ciencia, Tecnología e Innovación en Mérida, Venezuela. El 6 de Junio, 2013 se anunció en la Asamblea General de AERFAI que tuvo lugar en Funchal, Madeira (Portugal) el Premio AERFAI a la mejor tesis doctoral. El accésit ha sido asignado a Francesco Ciompi, por la tesis: “Multi-Class Learning for Vessel Characterization in Intravascular Ultra-sound” supervisada por: Petia Radeva y Oriol Pujol. The paper “Gradient Histogram Background Modeling for People Detection in Stationary Camera Environments“, by V.Borjas, J.Vitrià and P.Radeva received the Best Poster Award at the 13th IAPR Conference on Machine Vision Applications, Japan, 2013. 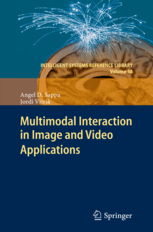 Multimodal Interaction in Image and Video Applications. Sappa, Angel D., Vitrià, Jordi. Springer, Series: Intelligent Systems Reference Library, Vol. 48. 2013, XIV, 203 p.
Traditional Pattern Recognition (PR) and Computer Vision (CV) technologies have mainly focused on full automation, even though full automation often proves elusive or unnatural in many applications, where the technology is expected to assist rather than replace the human agents. However, not all the problems can be automatically solved being the human interaction the only way to tackle those applications. Recently, multimodal human interaction has become an important field of increasing interest in the research community. Advanced man-machine interfaces with high cognitive capabilities are a hot research topic that aims at solving challenging problems in image and video applications. Actually, the idea of computer interactive systems was already proposed on the early stages of computer science. Nowadays, the ubiquity of image sensors together with the ever-increasing computing performance has open new and challenging opportunities for research in multimodal human interaction. This book aims to show how existing PR and CV technologies can naturally evolve using this new paradigm. The chapters of this book show different successful case studies of multimodal interactive technologies for both image and video applications. They cover a wide spectrum of applications, ranging from interactive handwriting transcriptions to human-robot interactions in real environments. You can get a copy from Springer and Amazon. Our work on automatic evaluation of psychological traits has been shown in the news. In a few days Mario Rojas will defend his PhD thesis “On the Use of Geometric and Appearance Information for Facial Analysis”, but is work has already been shown in the public Spanish TV (time stamp=1:20:30). Congratulations Mario and David! New tools for the diagnosis of intestinal diseases. Intestinal motility normally produces the propulsion and digestion of ingested food. Intestinal dysmotility is characterized by abnormalities in the strength and/or coordination of the movements of the intestinal tract. The current gold-standard test for evaluation of intestinal motility is intestinal manometry. However, it is an invasive procedure that can only be performed in specialized reference centers. Moreover, this technique can detect only severe intestinal motility disorders, but it can not detect the subtle abnormalities present in some patients with functional gastrointestinal disorders (FGID). The development of wireless capsule endoscopy represented a new opportunity for the diagnosis of intestinal diseases. This technology is based on a miniaturized camera, a lighting system and a wireless transmitter embedded in a container the size of a vitamin capsule (11x7mm). The capsule can be ingested by the patient and, as it travels through the digestive tract propelled by peristaltic movements, it transmits pictures of it to an external recorder. The trip takes about 3 hours, during which the camera sends around 30,000 images of the intestine that can be later inspected by a specialist. For more than five years, a research group lead by Dr. Petia Ivanova Radeva and Dr. Jordi Vitrià, specialists in Computer Vision and Medical Imaging from the University of Barcelona & Computer Vision Center at UAB, and gastroenterology specialists lead by Dr. Fernando Azpiroz from the Hospital Vall d’Hebron in Barcelona have worked together to develop a system for the diagnosis intestinal motility dysfunction based on the images provided by a wireless endoscopic camera. This system claims in diagnosing functional gastrointestinal disorders (FGID), characterized by chronic digestive symptoms that affect up to 30% of the general population. These patients do not show objective abnormalities with conventional endoscopic or imaging tests. It is accepted that a diversity of pathophysiologic mechanisms cause these disorders, including abnormal intestinal motility. From the medical point of view, research has focused on the description of motility patterns based on visual analysis of capsule images. From the technological point of view, research has concentrated on two aspects: the development of an automatic recognition system that allows the automatic extraction of the motility features from the images and designing a computer aided decision system to assist the specialist in his diagnosis. The system was first validated with a group of severe dysmotility patients and healthy volunteers from the Hospital Vall d’Hebron, obtaining a higher level of reliability than the current gold-standard methodology (intestinal manometry). Recently, it has also been demonstrated that the analysis of motility based on capsule images can also detect abnormalities in a proportion of FGID patients. This development could replace intestinal manometry as a non-invasive, amply available, test to diagnosis intestinal dysmotility. Its superior diagnostic capability in FGID could also help to better understand and manage these disorders. The results of this project are currently being transferred to Given Imaging, a world leading company in the field of gastrointestinal diagnosis, who has been supporting this research for several years. The Alan Turing Year 2012 marks the celebration of the life and scientific influence of Alan Turing on the occasion of the centenary of his birth on 23 June 1912. The international impact of Turing’s work is reflected in the growing list of countries and cities planning Alan Turing Year celebrations, including Barcelona, where a number of events will take place throughout the year.